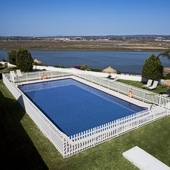 The Parador of Ayamonte is a quiet spot ideal for rest with panoramic views of the flood plains of the Guadiana river, the border between Spain and Portugal. The halls and rooms are fitted with modern facilities which are lit up by the Ayamonte sun causing the simple shades of the decor to produce a feeling of peace. The regional specialties served in the restaurant of this Parador are fishes, crustaceans and sausages. The area is also famous for its cured ham and the local shrimps and prawns. Local places of interest to visit include the San Francisco temple, the church of Nuestra Senora de las Angustias, and the Salvador church in Ayamonte. The Guadiana river is particularly beautiful and the opportunity should be taken to have a cruise up it while staying at this hotel. The coastal area is low lying and of particular interest to nature lovers since many species of birds rest in the area whilst on their migrations. Important religious days are an excuse for a 'festa' following the religious service. The parades at Easter and Carnival (Shrove Tuesday) should be seen. The local feast day of Nuestra Senora de las Angustias is celebrated on September 8th. In addition there is the International Music Festival which takes place in August each year. With a few days notice, the reception can arrange many activities in the area including sailing, sport fishing, horseback riding, hot air ballooning walking tours, etc. There are golf courses and tennis courts nearby or you could just relax around the pool. The Parador Ayamonte has thirty twin bedrooms, five double bedrooms, fifteen bedrooms with living room and two easy access bedrooms. All the rooms have a telephone, TV canal plus, mini bar and safe. The hotel is air conditioned and has central heating, restaurant and bar, currency exchange, satellite television, lift, garden with children's playground, seasonal swimming pool, parking facilities (without security and limited places) and free wireless internet. 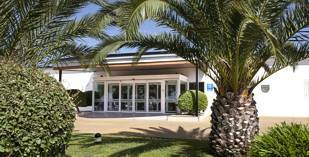 The Ayamonte Parador also has a conference room and there are facilities for the disabled. Distance from the nearest airport is approximately 54 kms, train station is 60 kms away and the nearest port is 60 kms away. Lunch is served at the 'Gastrobar' with an informal but complete offer. The restaurant is open for dinner. Breakfast and event services will still be served at the Parador. Enjoyable stay. I was happy to find the Parador easily as I arrived late in the evening after a 4 hr drive from Malaga. The situation overlooking the river is impressive and it is a great spot to tour from. It was very quiet when I was there at the end of October so the Parador was half empty, making eating in the restaurant rather lonely. The service and food were however excellent as was the check in and departure. Enjoyable stay. All facilities up to expectation. Friendly wellcome and friendly staff. Spectacular downtown area. Felt a little bit lonely in the restaurant for dinner. The place deserves more visitors. And they shall not be disappointed! It was our first experience with Parador, and expectations were quite high. We were there at end of November, which is not an extremely busy time. People served us well, the room was excellent (junior suite) with a very nice few over the Guadiana river and the town. The restaurant was good, somewhat basic perhaps. Too bad that it was too cold to sit outside! Overall, we were very satisfied. This was our first stay in a Parador. We had heard good things from friends and our expectations of good service, fine rooms and good food were fully met. We had a most enjoyable stay and recomend this parador. Based on our experience we will seek out other Paradors when next in Spain. 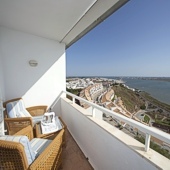 Luxury Parador hotel in Ayamonte looking over the Guadiana river to Portugal.